Who are you? MOV is my blog name. It stands for whatever you want it to stand for. I am a former career flight attendant, but my degree is in English Literature. I am married, and a stay-at-home mom to our two adorable, elementary-aged sons. We live on the East Coast. Describe your writing style. Sharp. Funny. Real. How long have you been writing online? Almost two years on my principal blog, mothersofbrothersblog, which is a humor site. 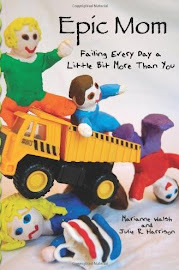 And I just published my first book a few months ago (a 240-page book called “Mom’s Had A Rough Day”—you can take a peek at it on Amazon). Which writing challenges do you do? Just Trifecta for now (which is giving me a great opportunity to explore my serious side). I also signed up for the A to Z Challenge in April. Describe one way in which you could improve your writing. Ha! It’s perfect! What is the best writing advice you’ve ever been given? Write what you know. I take an idea based on a real experience and embellish it. I write what I would want to read. Who are your favorite authors? I adore Laurie Notaro and David Sedaris. They are edgy, dark, clever. Even though I have never met either of them, they are both on the acknowledgement page of my book. Why do you write? Words attack my brain all day, every day. I must write them down or risk stray letters oozing out my ears. Give us one word we should consider using as a prompt. Parallel. Direct us to one blog post of yours that we shouldn't miss reading. This is one from my humor blog. Read THIS. yes, laurie notaro is definitely one of my fav's. Sharp. Funny. Real. Edgy. Dark. Clever. These adjectives lead me to believe I will enjoy keeping an eye on your work! Love David Sedaris - love elementary school kids too. They have the most interesting things to say.